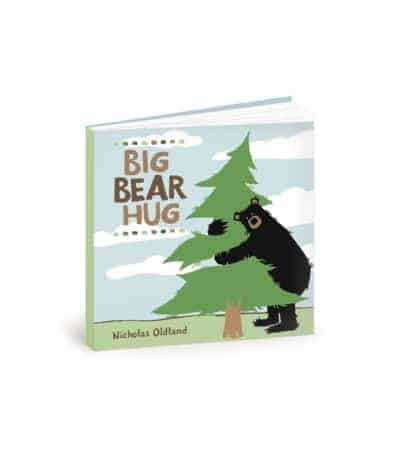 When Big Bear Hug by Nicholas Oldland arrived at my house on Friday, I was immediately drawn to the illustration of the bear on the front cover. I thought I would read the book before I shared it with my girls and, as I read it, I found myself grinning from ear to ear! I loved the story! There is such a positive message to be taken from this book about the joy you can get from sharing hugs with others! I also loved the fact that when the bear is faced with conflict and wants to react in anger, he thinks about actions and chooses to respond in a positive manner instead. I think the message behind his actions provides a great character education message for children! I also thought that the illustrations were brilliant and extremely funny! The drawing of the bear trying to hug a beaver and a tree at the same time was hysterically funny (the look on the beaver’s face is priceless)! I also loved the small details around the actions that are illustrated of the little bird who can often be found with the bear – they provide an additional dimension to the book for both children and adults. I was actually excited when I checked out the Hatley website and discovered that many of these characters are available on items such as shirts and water bottles too! After I read it this weekend I decided to wait a few days before sharing it with my girls but I did take the book to work to share with some of my colleagues. They all loved it as well and were asking me where they could buy a copy for their own children! I can’t wait to readÂ Big Bear Hug with my girls because I know they are going to love it as well! .-= Shelley T´s last blog .. =-. .-= Missy´s last blog ..Social Parade ! =-. I like’d Hatley on Facebook. I posted on facebook, thank you. Facebook is not privacy secure! I like Hatley on FB! .-= Tara´s last blog ..Giveway Daily Digest – May 31st =-. I tweeted and I follow you! I have your event button on my blog! I liked Hatley on Facebook. I became a fan of Hatley on Facebook. I joined the Simply Stacie Blog Frog community.